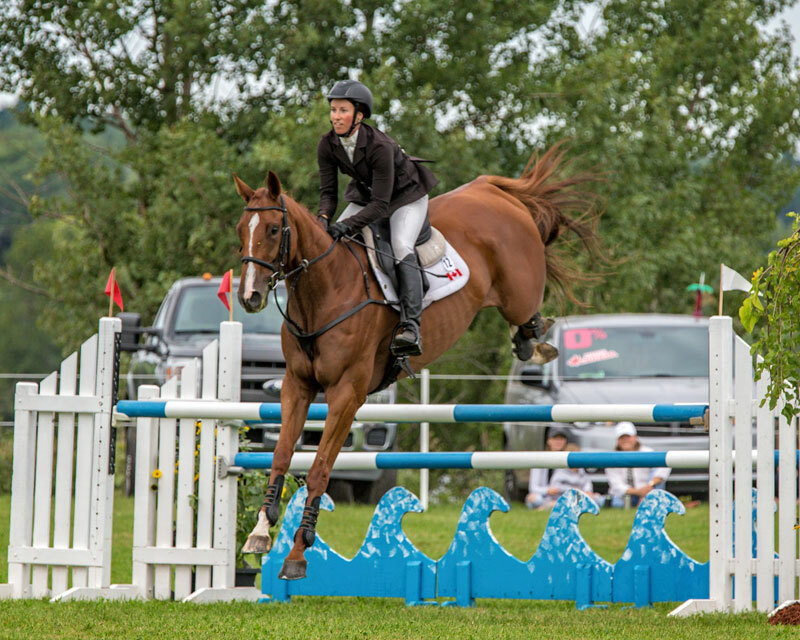 Holly Jacks Smither has won the Foshay International CCI1* with Finely Brewed (Bud) on a score of 32.00 after having a rail Sunday in the show jumping with her other horse, the leader after cross-country, Candy King (Mini-Me) who finished in second place with a score of 35.40. Holly who had lead the division from beginning was, I suspect, not overly concerned as the two horses simply swapped places at the top of the leaderboard to take home both the winning red as well as a second place blue. This Erin, Ontario resident who is originally from the province of British Columbia to follow this impressive win also took home top prize in the brand new CCI Introductory division riding a 8 year old Dutch Warmblood gelding Holly part owns with Mark Marquis called Favonious Nite (Favy). Holly and her husband Bruce Smither have race horses and show horses based at a facility in Erin, Ontario which they rent from a reiner who Holly wanted everyone to know “is a wonderful landlord”. Bruce trains horses at Woodbine Racetrack. EV105/Modified, the final division to complete show jumping on the James Atkinson course for the weekend and the only national level offered saw Uxbridge, Ontario’s Kendal Lehari and Audacious (Junior) win with a final penalty score of 31.80. Kendal who owns Junior, a grey 5 years Canadian Sport Horse gelding was brought the horse by the breeder, a family friend to be backed at the age of 3. Kendal liked him so much Kendal found a way to purchase the horse. Speak of plans for the near future Kendal said that this is the last event of the season and after a bit of time watching the World Equestrian Games happening in Tryon, North Carolina this month she has plans be married. Congratulations! If you have an questions about adding Foshay International to your calendar just ask the riders from five states and four provinces who traveled sometimes a fair distance to attending the event. They are raving about their experience at this inaugural event on the river’s edge in beautiful Jemseg, New Brunswick. This event which offered many firsts over the Labour Day weekend included a brand new CCI Introductory level which Foshay International is the first to offer in North America not to great mention prize money, prizes from Omega Alpha Pharmaceuticals and Greenhawk I am sure that co-organzizers Robert and Suzanne Stevenson have more surprises up their sleeves for the coming year.